Sharpy had the most liked content! I was born / lived in the tute 1952, we moved to bedlington station well before 1960, My grandparents had lived in clifton row. I think the new store was open well before we moved, I recall there was a family in a caravan living behind the store who got my old pedal car. Rochesters shop, "hut at the bottom of the garden" was still open. 3 Geoff Bell 5 John Bowman 8 Bill Ridge 10 Leslie ? 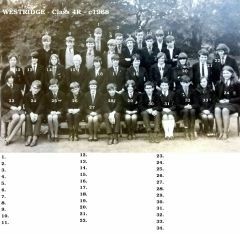 Hi, class 4R 1968 I think, if memory serves me. Yes please publish any you wish in the gallery, I will work on name's. Two more I have not seen published. Here is another " karting crew " Thats me, 2nd from right ! 3 is Fraser, 7 is Gibb, 7 may be John Harmison 8 John Hewish ?